Los Angeles radio host Leeann Tweeden says Sen. Al Franken, D-Minn., forcibly kissed and groped her in 2006 during a USO tour. "It happened so fast," Leean Tweeden said on her radio show this morning. "His tongue is wet and slimy ... to this day I call him fish lips." In 2008, during Al Franken's first Senate campaign, he was criticized for "misogynist remarks" and past jokes about sexual assault. Read our story from nine years ago. A Democratic senator says she believes the woman accusing fellow Democratic Sen. Al Franken (Minn.) of groping her during a USO Tour in 2006. “The first thing I want to do is apologize: to Leeann, to everyone else who was part of that tour, to everyone who has worked for me, to everyone I represent, and to everyone who counts on me to be an ally and supporter and champion of women. There's more I want to say, but the first and most important thing—and if it's the only thing you care to hear, that's fine—is: I'm sorry. “I respect women. I don't respect men who don't. And the fact that my own actions have given people a good reason to doubt that makes me feel ashamed. “But I want to say something else, too. Over the last few months, all of us—including and especially men who respect women—have been forced to take a good, hard look at our own actions and think (perhaps, shamefully, for the first time) about how those actions have affected women. “For instance, that picture. I don't know what was in my head when I took that picture, and it doesn't matter. There's no excuse. I look at it now and I feel disgusted with myself. It isn't funny. It's completely inappropriate. It's obvious how Leeann would feel violated by that picture. And, what's more, I can see how millions of other women would feel violated by it—women who have had similar experiences in their own lives, women who fear having those experiences, women who look up to me, women who have counted on me. “Coming from the world of comedy, I've told and written a lot of jokes that I once thought were funny but later came to realize were just plain offensive. But the intentions behind my actions aren't the point at all. It's the impact these jokes had on others that matters. And I'm sorry it's taken me so long to come to terms with that. “While I don't remember the rehearsal for the skit as Leeann does, I understand why we need to listen to and believe women’s experiences. “I am asking that an ethics investigation be undertaken, and I will gladly cooperate. "This incident was never reported to the USO. We have no knowledge of it. The report is deeply disturbing and does not reflect the values of the USO." • Said she also got a message from someone who claimed a similar experience, but didn't know who the person was and hasn't called them back yet. 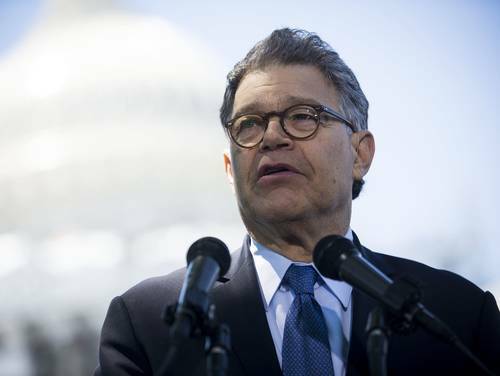 From the AP: Senate Democratic Leader Chuck Schumer says sexual misconduct allegations against Minnesota Sen. Al Franken are "troubling" and he hopes and expects that the Senate Ethics Committee will fully investigate. The USO says a claim that Democratic Sen. Al Franken sexually harassed a fellow performer during a 2006 tour hadn't been reported to the organization. The USO called the allegation against Franken "deeply disturbing." Minnesota Democrats are sharply criticizing Sen. Al Franken over a sexual harassment allegation. A fellow performer on Franken's 2006 USO tour to entertain service members abroad accused Franken on Thursday of forcibly kissing her during a skit rehearsal. Leeann Tweeden also posted a photo in which Franken is showing grinning at a camera with his hands on her breasts as she slept. State Democratic Chairman Ken Martin praised Tweeden for telling her story and said there was no excuse for Franken's actions. Martin said the party supports an ethics investigation. Sen. Amy Klobuchar, like Franken a Democrat, also criticized his behavior and called for an investigation. And Angie Craig, a Democrat running for Congress, announced she would donate $15,000 in campaign contributions from Franken to a charitable organization. Wisconsin Democratic Sen. Tammy Baldwin says she is donating $20,000 her campaign received from Minnesota Sen. Al Franken's political action committee to a group benefiting women veterans in the state. Baldwin Thursday joined with other Democrats in distancing themselves from Franken amid allegations that he forcibly kissed a woman in 2006. Franken also posted for a photo with his hands on her breasts as she slept. Baldwin said on MSNBC that "this type of behavior isn't acceptable whether it's from a Democrat or a Republican or an independent." Baldwin is up for re-election in 2018. Democratic congressional candidate Randy Bryce was also donating $1,500 he got from Franken to local charities. Bryce is challenging Republican House Speaker Paul Ryan. White House spokeswoman Sarah Huckabee Sanders says it's an "appropriate action" for the Ethics Committee to review the matter involving the Minnesota senator. 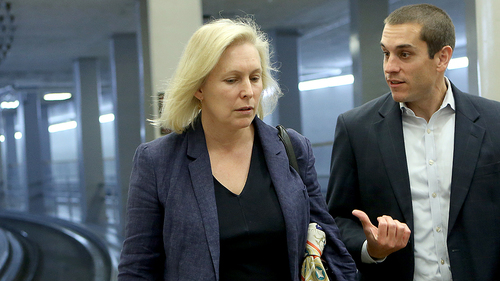 She told reporters it appeared the Senate was looking into that, "which they should." The allegations against Sen. Al Franken are the latest in a groundswell of complaints to surface in recent weeks. Here's a Q&A to get you caught up.